I’d like to introduce you to a friend of mine - Helena Handcart. Ok, she’s not strictly speaking a friend, she’s a business – an idea I dreamt up with one of my oldest friends back in 2016. But she was a while in the planning and by the time we’d made her a reality last year, we’d spent so much time discussing her that she almost felt real. You see, Helena is a positive and determined sort of a character. Feisty and no-nonsense but warm and loving. She’s focussed too, she knows what’s important to her and she wants to use art to make a difference. All this was the focus of many discussions with one of my oldest friends, Sus, on our monthly dinner dates in the Scottish borders. We live over a hundred miles apart (in Scotland and Northumberland) and there’s a little pub we go to – half way between our homes – that has, for the last eight years, been our retreat from all the other demands on our time. There we go to eat, drink, and put the world to rights. And, being illustrators, we often draw too – we find that, whatever is going on in our lives, drawing makes us feel better about things. Sus (right) and me outside the Bucchleugh Arms in the Scottish borders. Anyway, on one of those occasions while drawing and having a good old rant, we decided we were sick of feeling helpless amidst everything that was going on. We wanted to do something – even if it was only a very small thing – to make a positive difference. And we decided art could help us achieve that… and so the idea for Helena was born. So, to get back to introductions: Helena Handcart is a greetings card business that’s committed to doing some good. Sus and I design the cards and for every card we sell we make a donation to grassroots charities devoted to causes close to our hearts. I’d love you to visit our Etsy shop and take a look at all our cards. 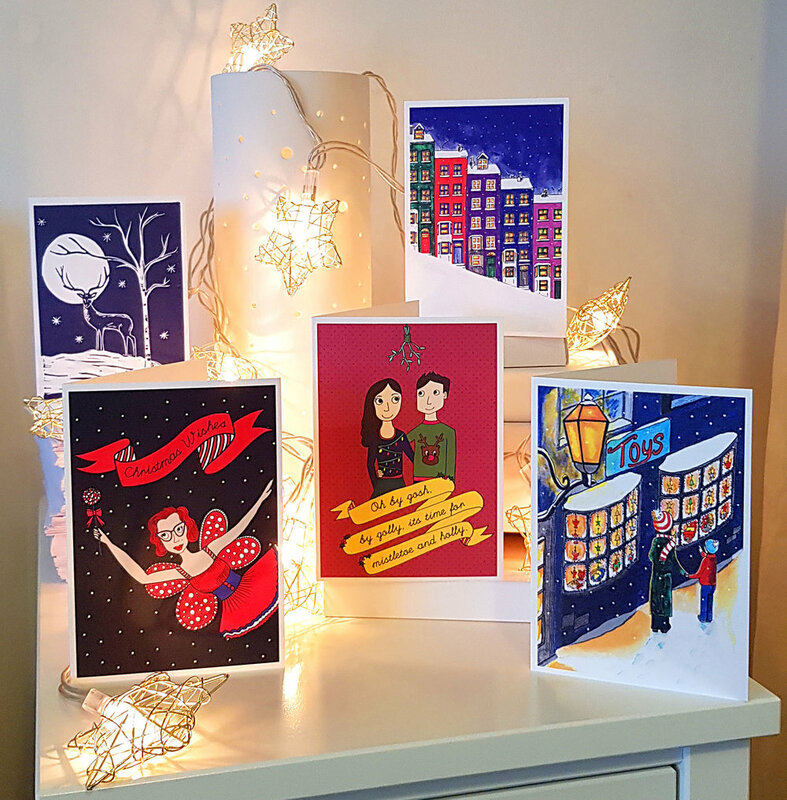 We’ve got all sorts of different designs (including some of my miniatures) and we’ve just brought out a new range of cards for Christmas!